I’ve been very slack with my blog posts of late, but it’s not lackadaisical or without good reason, so, before I just upload my next post without any explanation, I wanted to give you a brief update on what I’ve been up to. Things have been very slow and I’ve made little distance over the past couple of months, but for good reason. 2 weeks into entering Cambodia back in May, Surly Temple picked up a very bad limp and I came down with a few sickness obstacles, which lead me to extend my Cambodia VISA by another month. It was always my intention to attend a Vipassana meditation course whilst here in SEA, and I soon came to realise that these get booked up well in advance. So whilst waiting on bike parts and increasing baby wipe sales, I booked a 10 day meditation course at Dhamma Joti in Yangon, Myanmar, where I had originally intended on flying to, but decided to ride there instead, as you do. At this point, my slight predicament was with timings and visa’s. 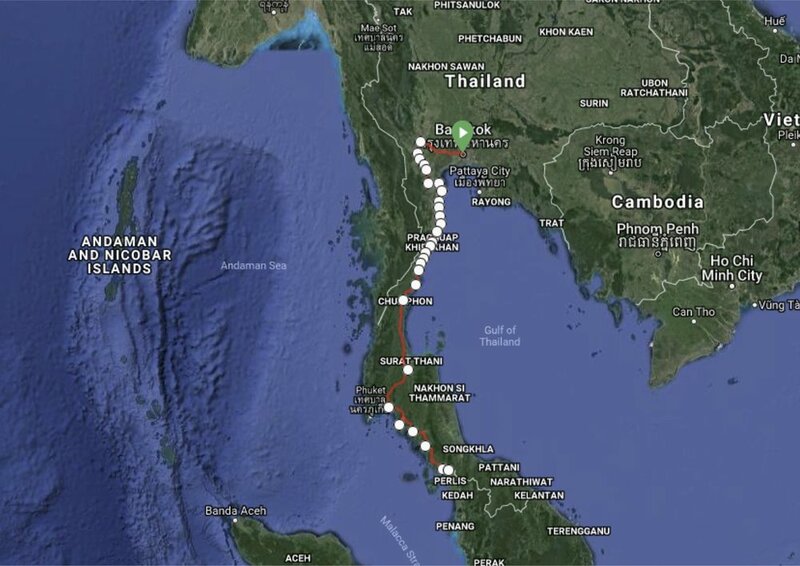 I had a 30 day visa for Thailand, and had to be in Myanmar on a set date, which meant calculating my time to enter and exit Thailand and enter Myanmar at a certain time, which consequently allowed me some time for planning. Nature took it’s course in Myanmar and nearly prevented me from attended the Vipassana meditation course altogether, which you’ll read about in my Myanmar blog post. I am now 7000km into the most incredible and liberating experiences and adventure of my time, and have now decided to step it up somewhat. In 1000km or 25 days, I will be entering Malaysia, my penultimate country, where I’ll spend around 2 months immersing myself in the culture, the food and planning the next chapter, before briefly exploring Singapore. Malaysia & Singapore will bring an end to the Andy- ETC online blog writing and my incredible time in Southeast Asia. The past 9 months have been an incredible journey and adventure, and Southeast Asia has been the perfect setting. I have learnt more about myself in the past 2 years, than I have in the past 33 ¾ years. This adventure has always been about elevating and challenging myself, and I’ve certainly done that, but now I want to step things up a bit. So, what have I actually been doing instead of uploading my blog? In December, I will arrive in a very cold Hokkaido, Japan, where, I’ll swap pen and paper, for video camera and microphone, and, warm beds and air-con, for sleeping bags, tents, camp stoves and the possibility of frostbite and hypothermia. Yes, that's right, from Japan onwards, Andy-ETC moves into the world of wild camping, but more importantly, the world of ‘Wild Cooking’ and Youtube. Yup, you heard it here first. Andy-ETC ‘Wild Cooking’, is a Youtube channel, where I will be taking food back to its basics, but with a little chef inspired finesse. Posting videos once a week, you’ll have the opportunity to learn, be inspired and see what it’s like to cook with the bare essentials over a camp stove, all seasoned with a little adventure and cycling, whilst trying to stay alive in constant sub zero temperatures. Andy-ETC ‘Wild Cooking’ will hopefully inspire and show fellow campers and home cooks just how simple it can be to cook delicious food, with minimal equipment and ingredients. Wild Cooking is about using the most versatile ingredients, which can be applied as successfully in your home kitchens as it can in a tent. Andy-ETC ‘Wild Cooking’, will introduce you to a cornucopia of ingredients as I travel through Japan and onwards. Delicious but simple food, weekly recipes from around the globe, tips, tricks, adventure, cycling, tales and inspiration. Think Jamie Oliver, Bear Gryls, Ray Mears and Bradly Wiggins combined. Bike touring comes with its list of risks, but add a bit arctic weather, lots of snow and wild camping to that, and you’ve got a whole new list of risks which are significantly more daunting and life threatening. Like anything, much of that risk can be reduced by careful planning and understanding, and that, my family, friends, followers, fans (smiley face), is what I have been spending my time on. The list of equipment needed for such an adventure requires some research and careful consideration, and the advice even more so. “Layering is critical”, “only use wool base layers”, “your feet will be the coldest part of your body” “don’t wrap anything too tight” “use lithium batteries” “all electronics battery life is considerably reduced in the cold” "put batteries in your sleeping bag with you" ”try not to sweat when riding” “what’s the R-value of your sleeping mat”? “you’ll want a vapor barrier between your base sock and your thick sock” are just a few of the simple considerations, but the key is, be prepared. This, along with cooking equipment, bike winter equipment, video equipment, learning to edit videos and general research about how to survive in -20 conditions, has kept me occupied. Japan has international acclaim for some of the best powder skiing in the World, called ‘Japow’. Lighter, fluffier and deeper than anywhere in the world with winters often graced with 15meteres+ of snow a season. 15 METERS!!!!!. Now, I’d have to be a complete ‘melt’, (see what I did there) not to take advantage if this, so expect to see a bit of snowboarding, hiking and cooking in the mountains. 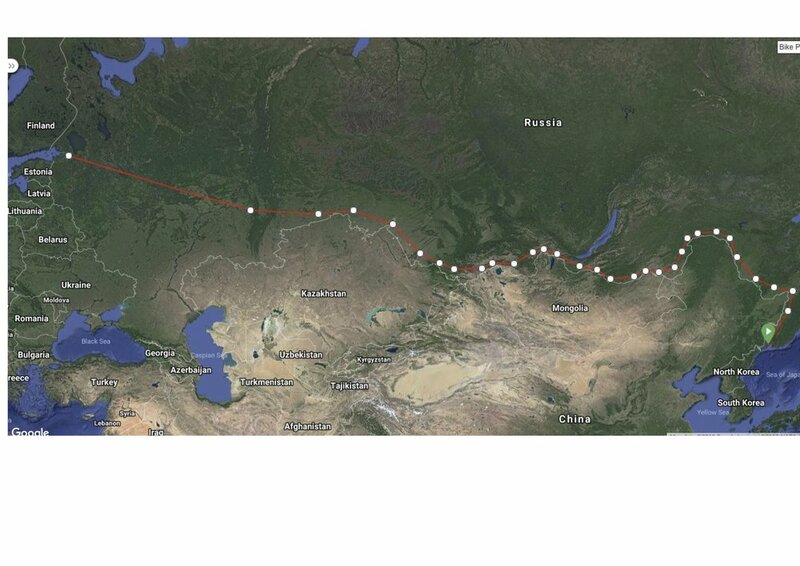 Japan will see me ride from north to south, experiencing Japanese food, culture and some zen Buddhist retreats. 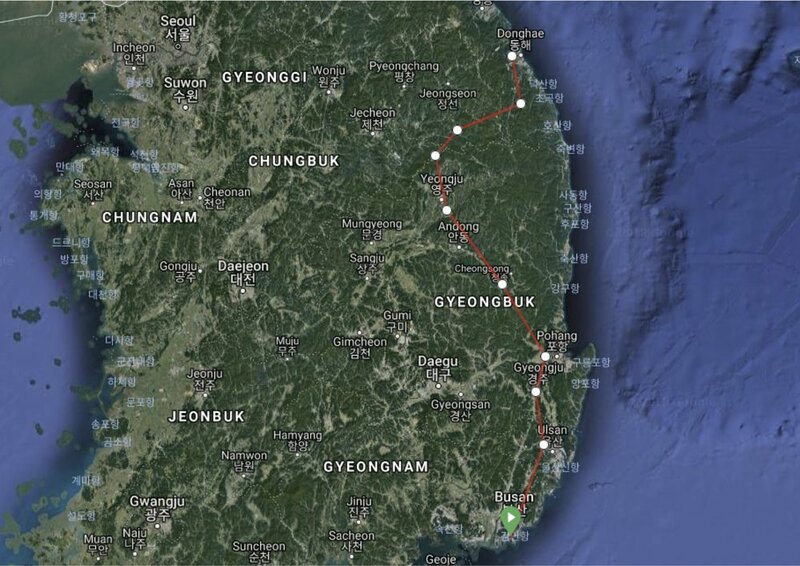 A quick ferry ride will take me into South Korea on route to Vladivostok, Russia, where I’ll ride the 7 day Trans Siberian Railway across the vastness of Siberia to St Petersburg. No hanging around in St Petersburg, I will hit the road and cross into Finland, where Andy-ETC ‘Wild Cooking’ will continue as I cycle north into Lapland and the arctic circle, in hope for wild camping under the Aurora Borealis and meeting Father Christmas; 2 real life ambitions. Continuing further north into the arctic circle and harsher landscapes, with wild camping under almost 20 hour daylight likely, I will continue west through Sweden and into Norway, heading south, where I’ll continue to respectfully accept the “Every Man’s Right” which allows anyone to wild camp anywhere. 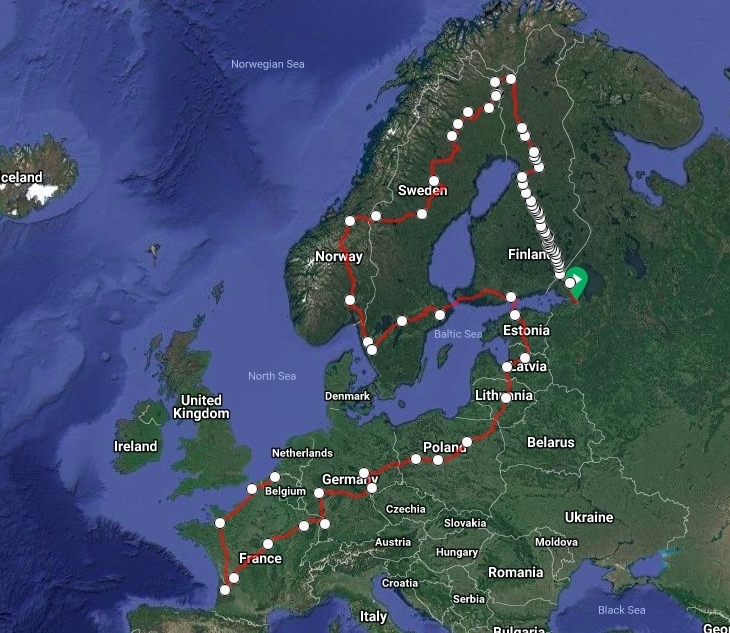 From Sweden I will cross over to Estonia by ferry, and continue cycling through Latvia, Lithuania and across Central Europe, from Poland into Germany, France and then the UK. .....and the adventure never will!, but thats for another day. This particular adventure doesn't stop there. I've seen and visited very little of Great Britain, and since I've cycled this far, why on earth would I stop here! 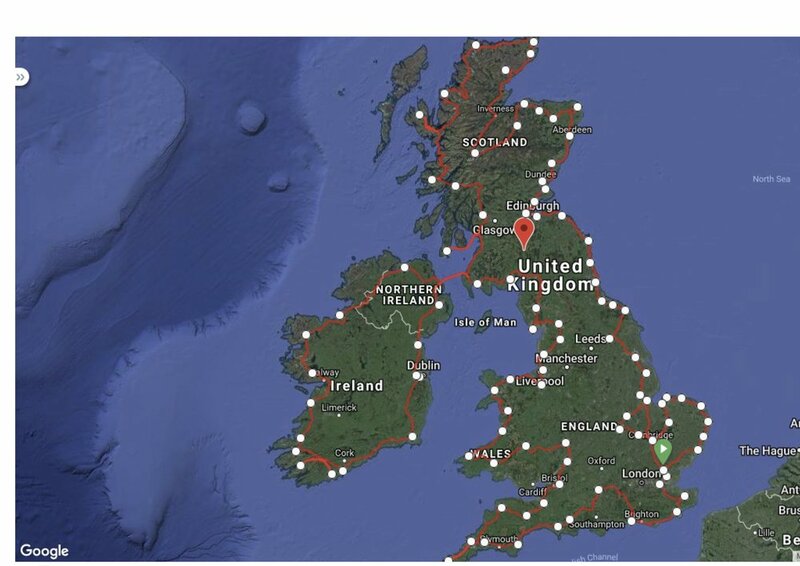 The plan, to circumnavigate the entire British Isles on Surly Temple. Whilst this adventure has been a personal journey, a charitable cause has always been on my agenda and is a frequent consideration, and I now feel it’s time to give back, contribute, inspire and share this experience in a way I can. I am excited to announce that I will soon be releasing details of an Andy-ETC fundraising campaign on behalf of a very worthwhile cause. More details on that to follow. Until then, thanks for reading and I hope you are all happy.